I am fan of the patterned paper my friends. Just like color and embellishments, I use the layering of different patterns to evoke the feeling that I want to convey in my layouts. 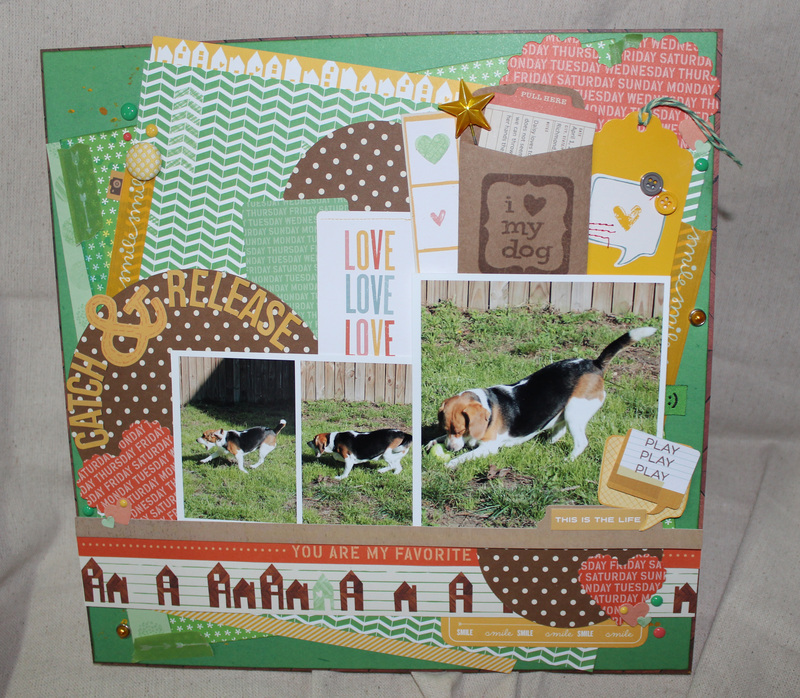 In this layout, I used 9 different pattern papers. Count em’ baby! By placing the patterned green paper on an angle, I wanted the viewer to immediately feel the whimsy and humor of the moment. And speaking of patterned paper- I pulled out the fabulous Amy Tan’s Ready Set Go Collection. Perfect collection to highlight the antics of my wonderful fur baby. Yes, there is a lot of embellishment and pattern on this layout. I tackle the issue of the viewer not focusing on the important part by sticking to a unified color scheme with just pops of accent colors for interest and a bold brown polka dot pattern paper in a focal triangle around my pictures. 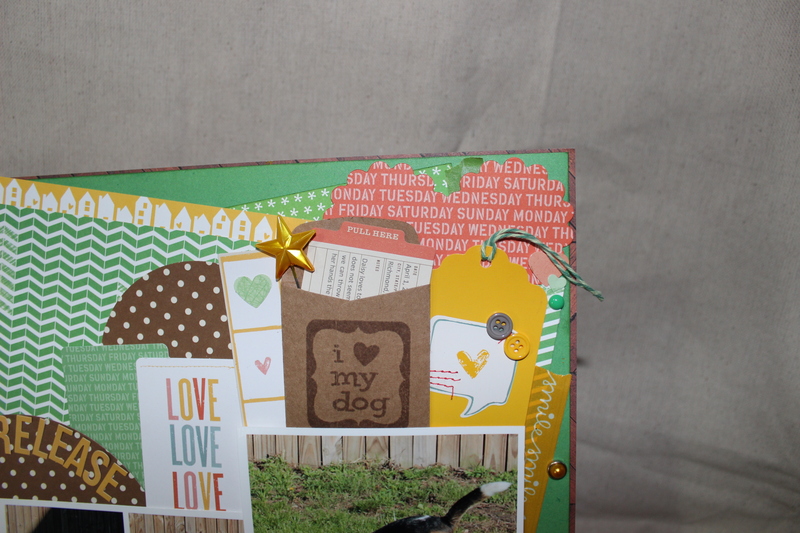 I typed my journaling on a die cut from the cardstock pack and then tucked it into a kraft coin envelepe. 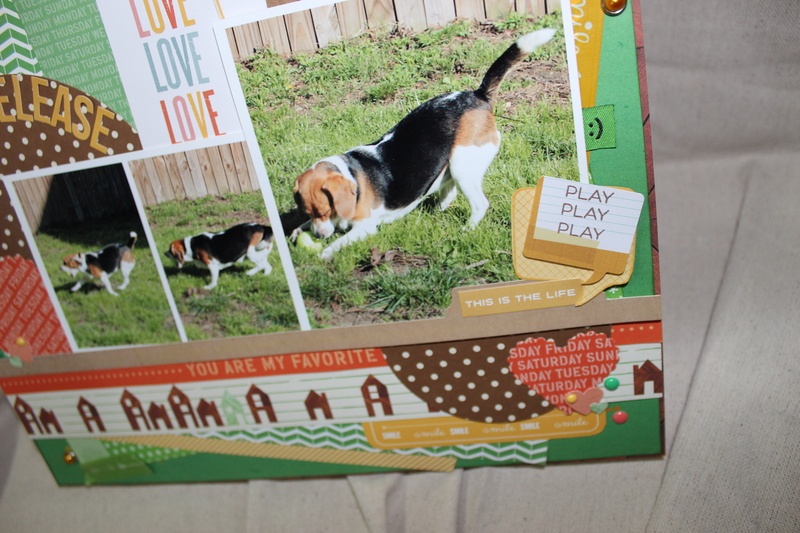 The journaling reads: Daisy loves to play catch with the tennis ball. She does not grasp the concept of release so we can throw the ball again. Once that ball is in her paws the game is pretty much over. Title: Catch & Release. Patterned Paper: American Crafts-Amy Tan Ready Set Go (Coffee Break, Green Light, Why Thank You, Get Cozy, Conference Call, Lounge Fest, To Do List) – Amy Tan Sketchbook (Charlotte’s Shade). 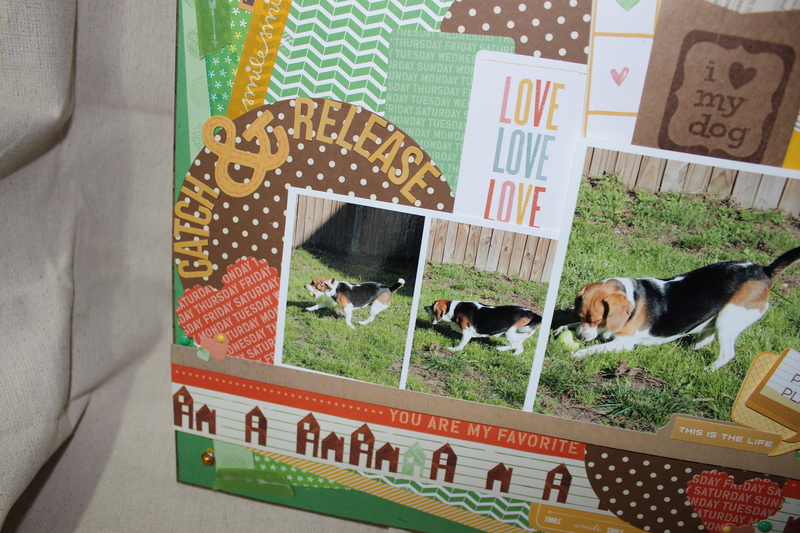 Stamps: TPC (Bad to the Bone), Studio Calico (February Project Life kit). Die Cut & Punches: Spellbinders (classic scalloped hearts, grand circles), Martha Stewart Crafts (Heart Confetti). Marvy Uchida-clever lever punch (hearts, giga circle). Embellishments: American Crafts-Amy Tan Ready Set Go (die cut cardstock shapes, decorative tags), Simple Stories-Snap (letter stickers, Typeset stickers, Icons, Fundamental cardstock stickers), My Mind’s Eye- Enamel Dots, Echo Park-For the Record 2 Tailored (brads),Basic Grey-Fact & Fiction (stitched brads, woven labels), maya road-vintage trinket pins (superstar gold), ki Memories- washi tape (smile), Trendy Twine (twisted lime), Misc- (Kraft coin envelope, Studio Calico kit-washi tape). Inks: Stampin Up (gumball green), Momento (rich cocoa), Adirondack Acrylic Paint Dabber (Butterscotch, Sunshine Yellow).